The applications on your laptop are designed to make your life easier. Applications are often designed to allow you to move or copy content from one to the other. For example, you might copy an image on a PowerPoint slide and paste it into a Word document. Click the Start button, click the All Apps button, and open two applications. Browse and open documents in the two applications. 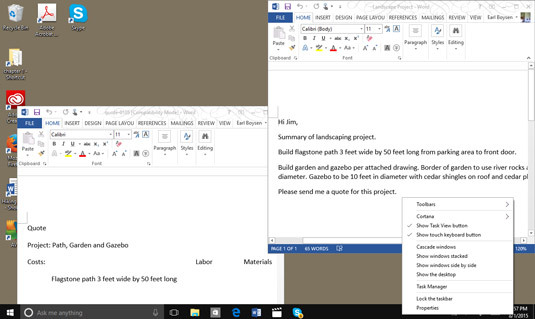 Right-click the taskbar and choose Show Windows Side by Side or Show Windows Stacked. Select the information that you want to move (for example click and drag your mouse to highlight text or numbers, or click on a picture in a document). 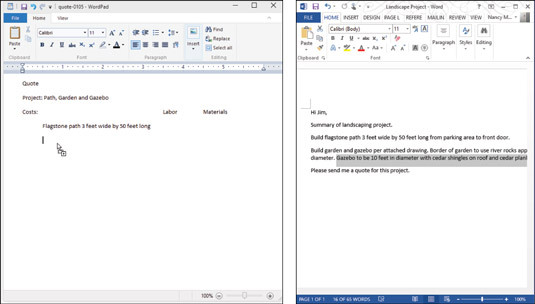 Drag the selection to the other document window. Release your mouse, and the information is copied to the document in the destination window. You can also use simple cut-and-paste or copy-and-paste keystroke shortcuts to take information from one application and move it or place a copy of it into a document in another application. To do this, first click and drag over the information in a document, and then press Ctrl+X to cut or Ctrl+C to copy the item. Click in the destination document where you want to place the item and press Ctrl+V. Alternately, you can right-click selected content and choose Cut, Copy, or Paste commands from the menu that appears. Remember, dragging content won’t work between every type of application. For example, you can’t click and drag an open picture in Paint into the Calendar app. It will most dependably work when dragging text or objects from one Office or other standard word-processing, presentation, database, or spreadsheet application to another.